Here I have made a delicious cake using Buckwheat Tea, and now I will introduce this simple recipe so you can enjoy this your family and friends. 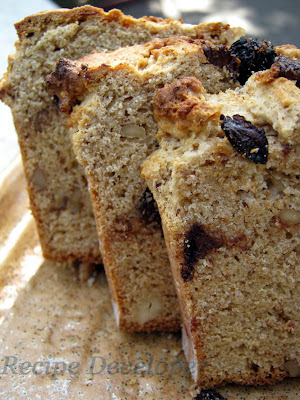 This cake is made with milled Buckwheat, Wheat Flour, Butter, Brown Suger, Trailmix, and Walnuts. I didn't add much sugar to this recipe, so it turned out more like bread. The combination of these ingredients will give this bread like cake a very wholesome and natural flavor. This is a very delicious type of coffee cake or great as an afternoon snack. 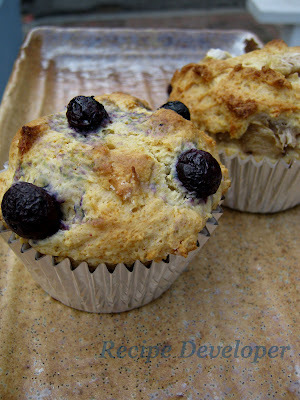 I also made some muffins again with some milled SOBA-CHA (Buckwheat Tea). This time I used a popular pancake mix (Bisquick), it was much easier and faster. I also added some melted butter to make the muffin more softer. My husband liked this very much, especially the blueberry one. By the way, did you know that blueberries are high in antioxidents?